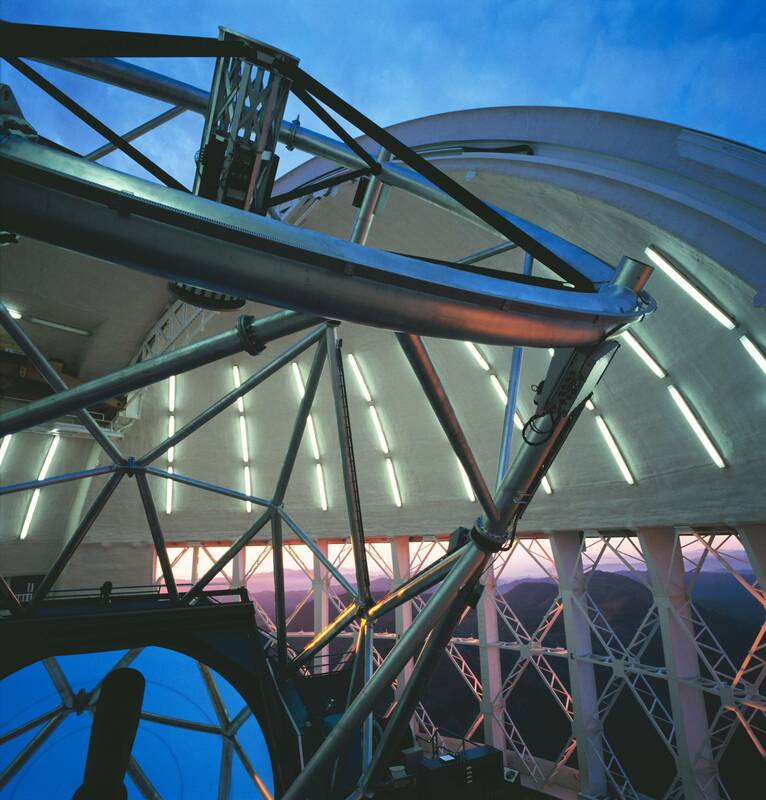 This image shows the interior of the Gemini South Telescope by daylight. 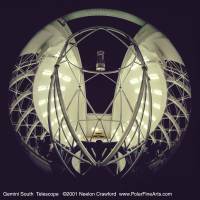 The camera used for this image was a "All-Sky" 2-pi 4X5" camera on loan from the American Museum of Natural History and used by Neelon Crawford - Polar Fine Arts. 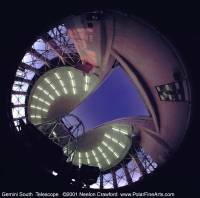 Photo Credit: "Photo Courtesy Neelon Crawford - Polar Fine Arts/AMNH/Gemini Observatory"
This image shows the interior of the Gemini South Telescope with a dark nighttime sky outside. 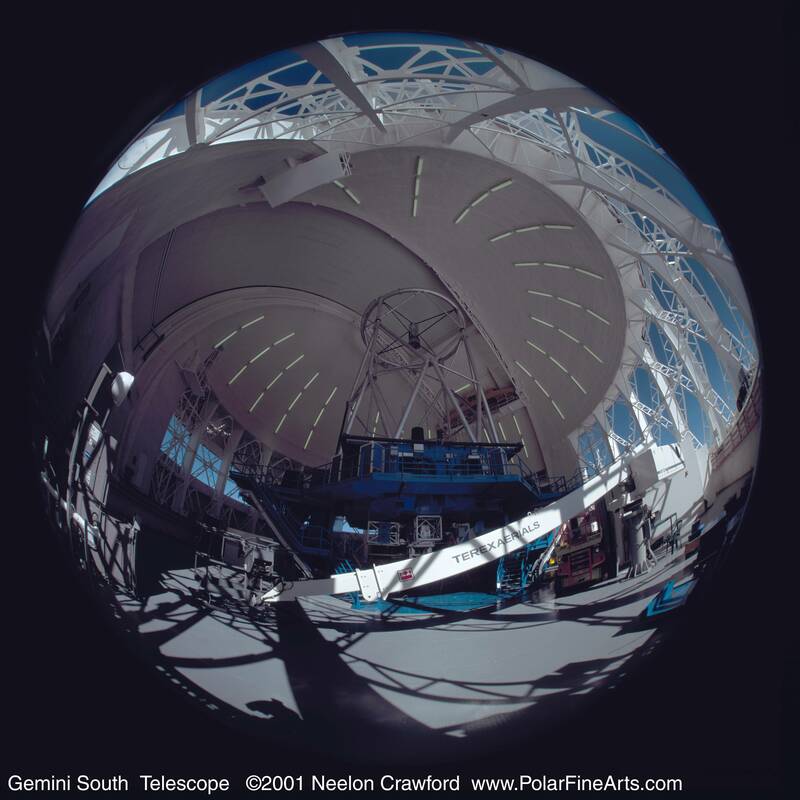 The camera used for this image was a "All-Sky" 2-pi 4X5" camera on loan from the American Museum of Natural History and used by Neelon Crawford - Polar Fine Arts. This image shows the interior of the Gemini South Telescope just before sunset. The camera used for this image was a "All-Sky" 2-pi 4X5" camera on loan from the American Museum of Natural History and used by Neelon Crawford - Polar Fine Arts. An interior shot from a catwalk on the Gemini enclosure (dome) showing the reflection of the early twilight sky on the mirror and the colors of sunset in the open vents. 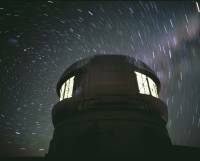 Photo Credit: "Photo Courtesy Gemini Observatory"
This relatively short exposure (5 minutes) shows the Gemini South dome operating under the stars of the South Celestial Pole. This time exposure image shows the Gemini South Telescope under a dark night sky with the stars around the South Celestial Pole circling overhead. 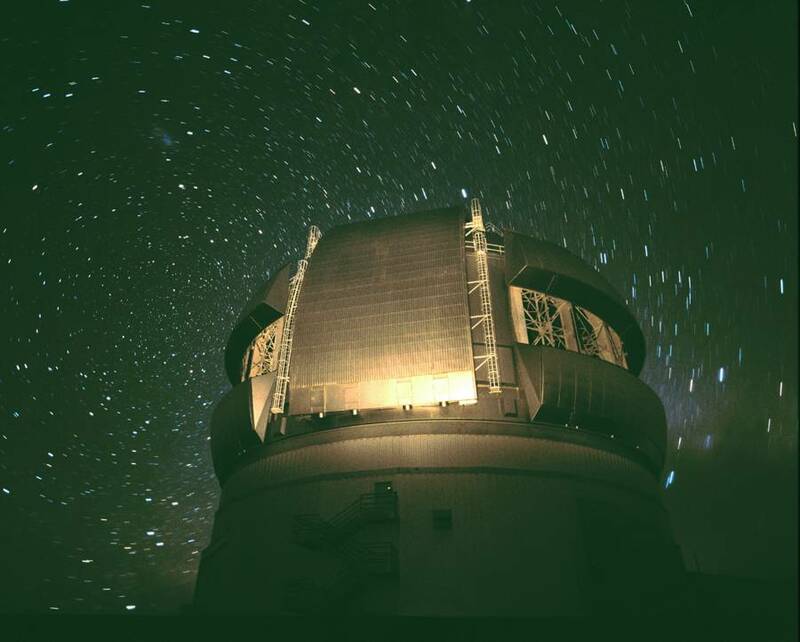 The work lights were on for calibrations allowing for this "rare" nighttime shot with interior lights on. 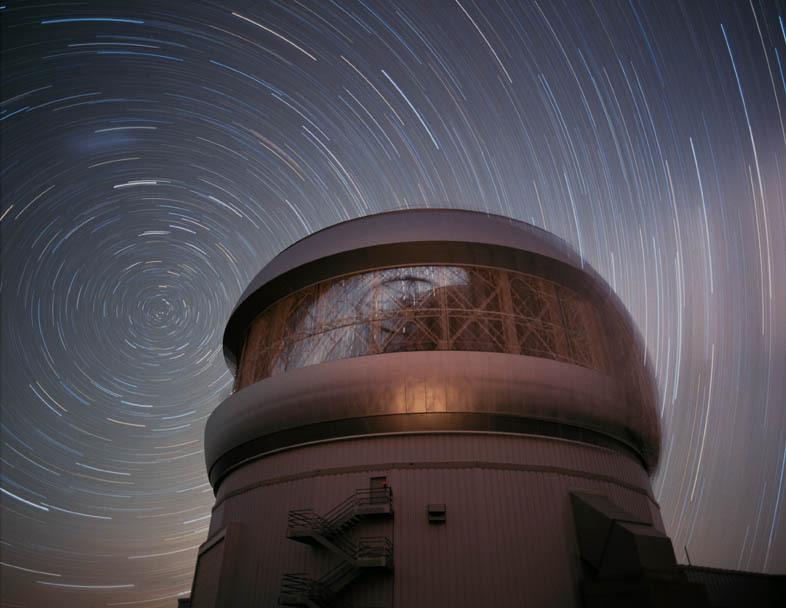 This time exposure shows the stars of the South Celestial Pole circling over Gemini South with the Large Magellanic Cloud visible as a faint 'smudge" at the upper left. 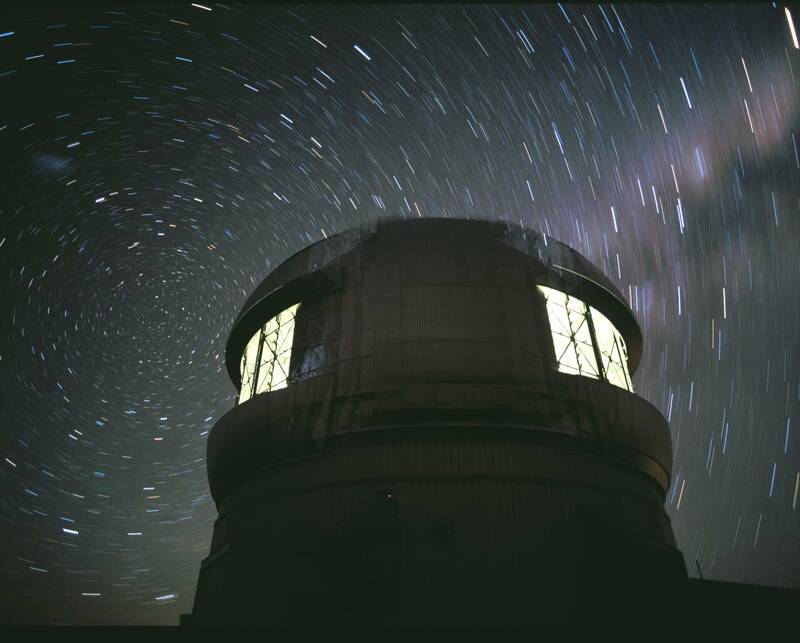 Motion of the Gemini Enclosure (dome) is also visible during the course of this 45 minute exposure. 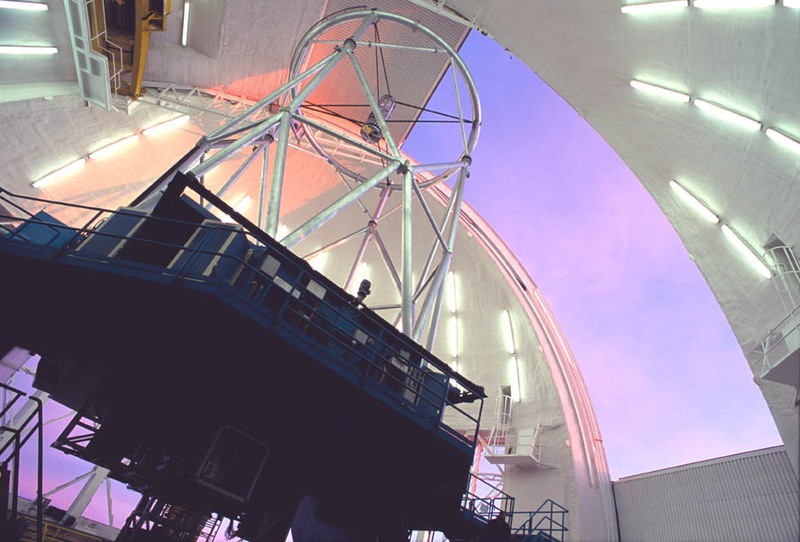 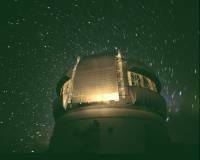 Photo Credit: "Photo Courtesy of Gemini Observatory"
This view of the Gemini South Telescope shows the telescope structure as it prepares for a night of observations. On the back the Instrument Support Structure can be clearly seen and some of the brighter stars can be seen through the open observing slit. 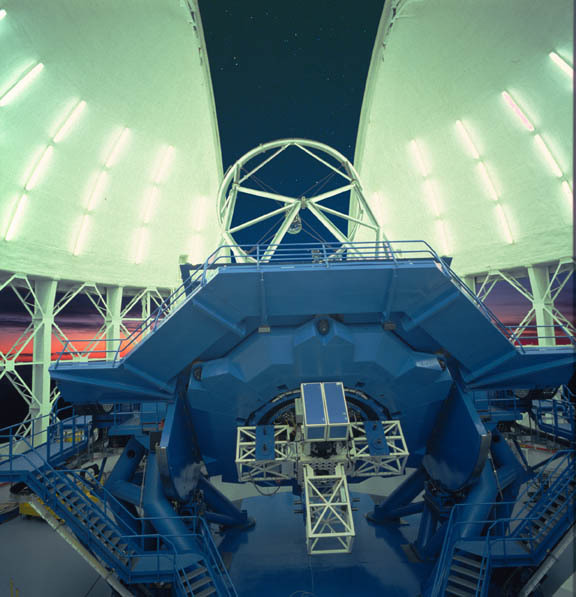 Gemini South looking up from the "Observing Floor" with the Instrument Support Structure to the lower left, and the partially-open observing slit to the right. 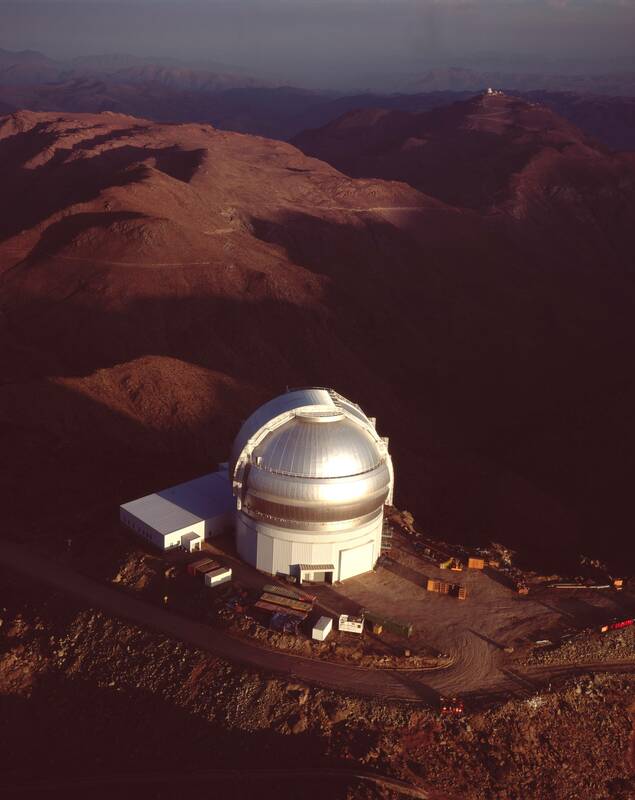 This image shows an aerial view from a helicopter of the summit area of Cerro Pach on and Cerro Tololo in the back right corner of the image. This image was obtained using a 4"X5" camera and is available in very high resolution upon request. 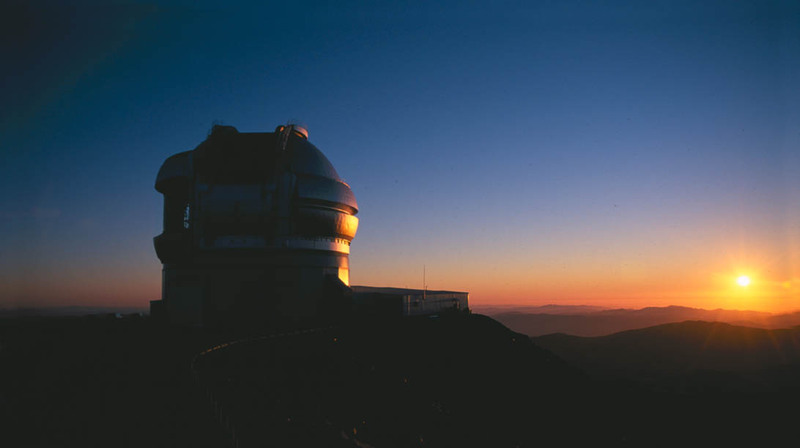 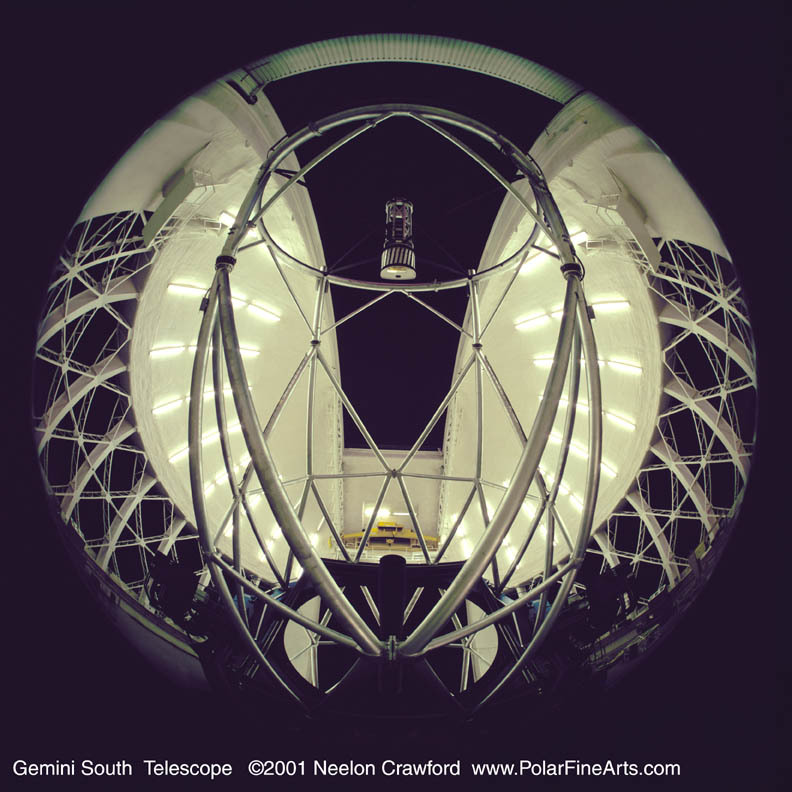 Photo Credit: "Photo Copyright 1999, Neelon Crawford - Polar Fine Arts/NSF/Gemini Observatory"
This image of Gemini South at sunset shows one vent gate open and the observing slit open for a night of observations. The image was obtained in late 2001 by Gemini's Chris Carter on 35mm film using a Nikon F5. 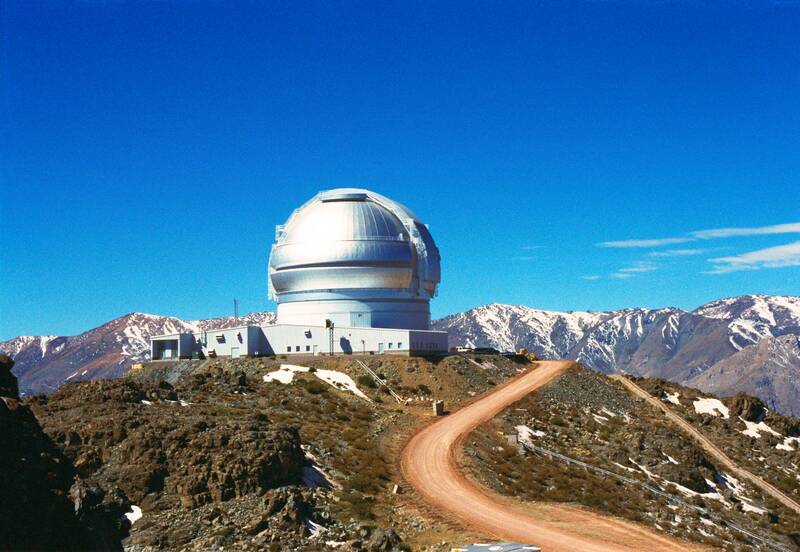 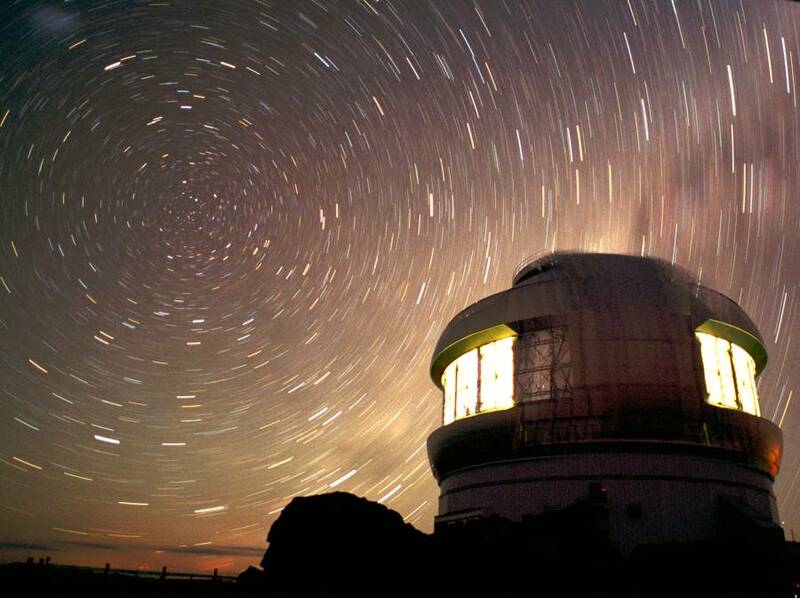 Photo Credit: "Photo Courtesy Gemini Observatory/Chris Carter"
This view of the Gemini South Telescope shows the entire mountaintop facility on Cerro Pachon in Chile. 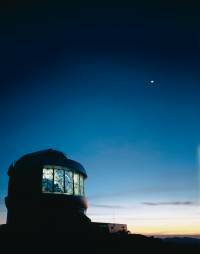 The telescope is located at an elevation of 8895' or 2723 meters and snow can be seen on the mountain as well as on the distant peaks. 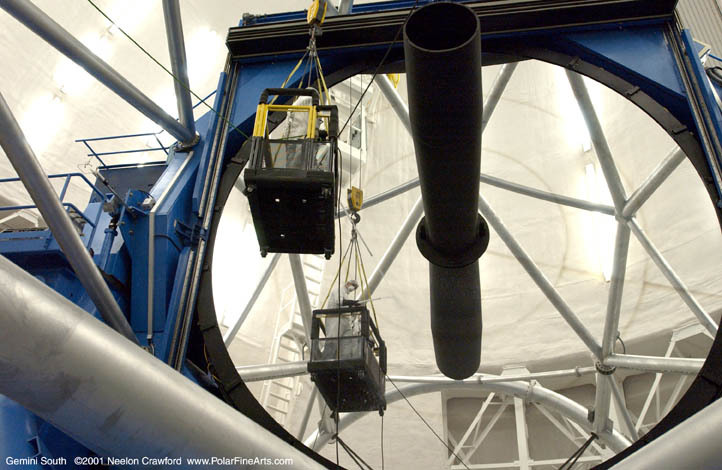 This image shows the weekly cleaning of the Gemini mirrors using Carbon Dioxide snow to remove dust and other materials that can collect on the mirror's surface.